Manchester UTD and Leicester lock horns on this year's Premier League opening match and bookmaker Coral is offering a massive 28/1 for A Goal To Be Scored (over 0.5 goals). This is your best chance to start the new football season with a BANG! Stake £1, get a £28.00 return as soon as a team finds the back of the net! Plus, receive £5 free bet if the match ends in a goalless draw! Manchester UTD endured a rotten pre-season and the situation is becoming increasingly tense at the Old Trafford. Leicester recorded a series of mixed results over the summer but will aim to upset a struggling United. Are you placing a bet on this match? You can earn £28 if the match doesn't end in a 0-0 draw! Find below how to claim your 28/1 price boost for A goal to be scored in Manchester UTD v Leicester! Coral offer 28/1 ANY Goal to be scored in Manchester UTD vs Leicester + £5 free bet! Register a new account with Coral before the start of the match (Friday 10th August, 8.00 pm, UK Time) and claim 28/1 ANY goal to be scored during Manchester UTD v Leicester! You won't find a better promotion today! Manchester UTD managed to keep only one clean sheet in 6 presason friendlies this summer. The only team who failed to score against the Red Devils was MLS outfit San Josè Earthquakes. Leicester also failed to keep a clean sheet in 4 of their 5 warm up matches this summer. The Foxes conceded to Notts County, Valencia, Udinese and Lille. Man UTD secured a comfortable 2-0 win over the Foxes at Old Trafford last term. This bet (Over 0.5 goals) is normally available at 3/50, but you can claim a 28/1 price boost! Max bet at boosted odds is €/£1. Exceeding stake will be paid at normal odds (in cash). Free Bets are valid for 4 days. Stake not returned. Should you lose your qualifying bet, you will receive a £5 free bet. This offer is not available to customers who open new accounts depositing funds with Moneybookers, Paypal, Paysafe, Neteller or Skrill. 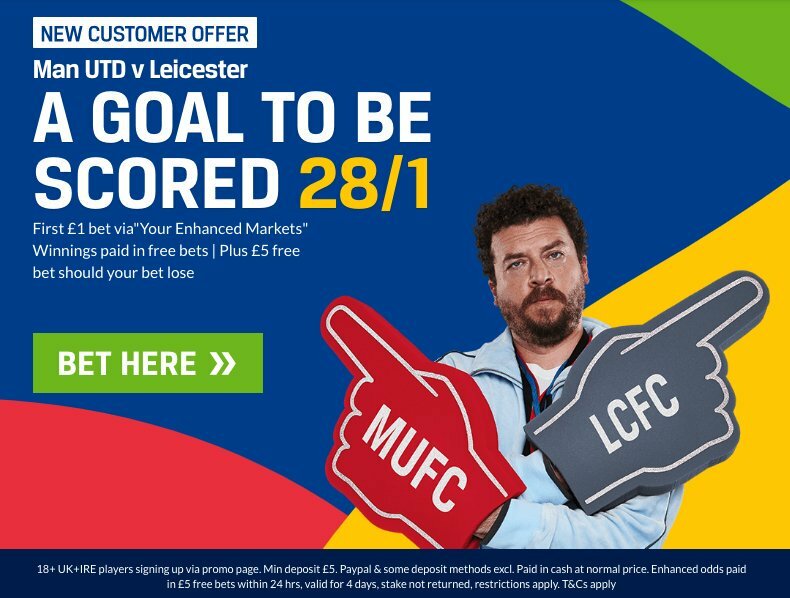 "Get 28/1 A Goal To Be Scored in Man UTD v Leicester with Coral"